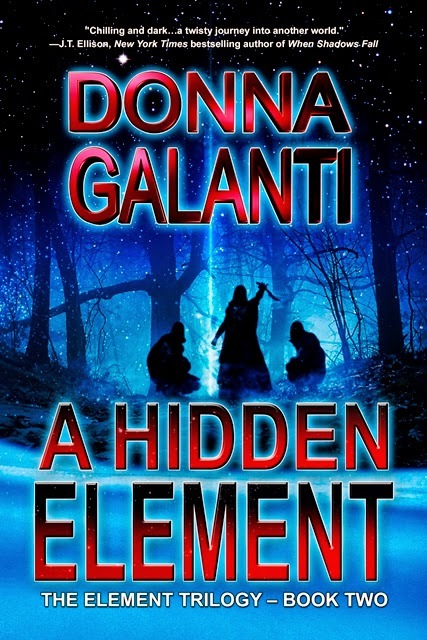 Book 2 in Donna Galanti’s paranormal suspense Element Trilogy has been released. Scott Nicholson, international bestselling author of The Red Church, says it’s "a darkly fresh take on the paranormal genre,” and Jordan Dane, bestselling author of the Sweet Justice series, notes it’s “bone-chilling suspense with a tantalizing palpable menace readers will devour." Enter A HIDDEN ELEMENT Release Giveaway here or below to win books, $100 Amazon gift card, movies and more! knees drawn to her chest. Her golden brown hair flowed around her, strands of pure bronze covering her in light. She looked up, eyes wide with fear. Tears dropped like clear pearls from her emerald eyes. Eyes he had looked into with desire and yearning long ago. She put her head on her knees. he sacrifice what he most desires to do so? still wishing for a castle again—preferably with ghosts. Mary, thanks so much for having me back on and sharing a creepy excerpt from A Hidden Element! Book 1 in the Element Trilogy, A Human Element, is also on sale this week for just 99 cents.